In addition to the public events and panels listed below, Robert Shetterly will give two private presentations for students and fellows at Syracuse University, including one on Narrative Activism. Says Shetterly, "I will give an overview of the Americans Who Tell the Truth portrait & education project, how it began, why, and what it has become. I will focus on the lives and work of several of the portrait subjects as they struggled for some kind of social, economic or environmental justice. We will see that most schools and media neither teach the work of these people nor the fact that without them the reality of life in the US would continue to be hypocritically separate from its own ideals. The point is that we need to know these people as models and inspiration for the work all of us need to do as citizens. They give us permission and encouragement to become activists. That's Narrative Activism. And we will stress the power and importance of a single person acting with courage and persistence." Syracuse University, in partnership with Upstate Medical University, SUNY Cortland and ArtRage, will host "American Whistleblower Tour: Models of Courageous Citizenship" with a series of events to be held this month. 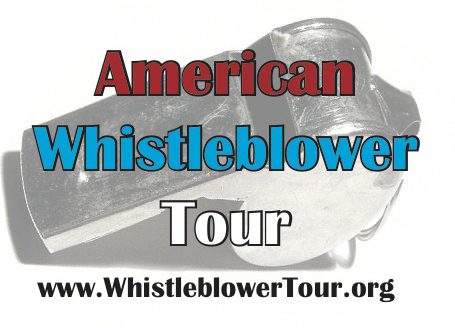 Part of a national campaign sponsored by the Government Accountability Project (GAP), theWhistleblower Tour seeks to educate the public—particularly university students—about the phenomenon and practice of whistleblowing. "Leaks, leakers and whistleblowers—this is a hugely important area not only in the debate over government regulation and surveillance but in journalism circles, especially with issues of reporters' confidentiality and newsgathering," says Roy Gutterman, director of the Tully Center for Free Speechat the S.I. Newhouse School of Public Communications and one of the organizers of the conference. "Bringing these whistleblowers to Syracuse to discuss their role in debates on public affairs will help bring these issues to our students and the community." Susan Wood, a champion of women's health who quit a position with the Food and Drug Administration when she concluded that politics were delaying the approval of Plan B, also known as the "morning-after pill"
In conjunction with the event, Shetterly will also give several guest lectures at the College of Visual and Performing Arts (VPA). In addition to Newhouse and VPA, participating schools at SU include the Maxwell School of Citizenship and Public Affairs and the Martin J. Whitman School of Management. GAP is the nation's leading whistleblower protection organization. Through litigating whistleblower cases, publicizing concerns and developing legal reforms, GAP's mission is to protect the public interest by promoting government and corporate accountability. Founded in 1977, GAP is a nonprofit, non-partisan advocacy organization based in Washington, D.C.